The rescue group on the scene called it the worst animal seizure it had ever seen. 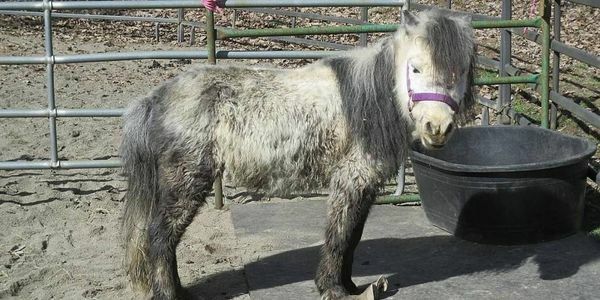 23 miniature horses with painfully overgrown hooves — plus 10 goats, eight dogs, two cats, three rabbits, and more than 200 chickens, turkeys, ducks and other birds — had to be removed from a farm in Thurston County, Washington, all in deplorable condition. These animals deserve better! Make sure the police investigate the farm's owners for neglect and charge them with animal cruelty. Local authorities investigated the farm when it received complaints about starving and mistreated animals and were shocked at what they found. Hundreds of animals on the farm were left without access to clean water or food — many were sick and had visible body sores. Thankfully, Thurston County's Animal Services and local rescue group, Hooved Animal Rescue of Thurston County, have now taken in the abused horses and other animals. The rescue group's president told local news, "When we put fresh water down for (the animals), they just scrambled for that water. I don't know how long it has been since they had fresh water. It was heartbreaking to see that." The Thurston County Sheriff's Office has said they may charge the farm owners for animal cruelty — but no changes have actually been filed. We need to make sure they take this seriously and investigate, find, and charge these abusers to the fullest extent of the law. We need to send a message to others that animals should NEVER be treated in such a cruel and neglectful manner. Please sign and share to make sure the Thurston County Sheriff sees that animal lovers all around the world are watching and demand justice for these poor mistreated animals.